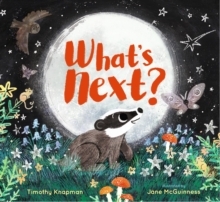 A sweet, suspenseful story of a baby badger and his dad with rich, atmospheric illustrations from Jane McGuinness. Curious Baby Badger loves exploring. He is eager to see, and know, more of the world beyond his den. So, one night, his daddy takes him on a moonlit adventure through the still, black-and-white forest up above their underground home. And that sets Baby Badger's imagination soaring. What's daytime like? he wonders. What's next? A tender father and son story of adventure, discovery and the comforting pull of home, paired with rich, evocative illustrations from Jane McGuinness.